Hiding everything under its folds. Of her beloved and her child. To fly to heights unknown. Ensconced in mores and traditions. The source of Feminine Endurance. Latha Prem Sakhya, a Professor of English, and a painter poet, retired in 2015, after thirty years of service at Mar Thoma College For women, Perumbavoor, Tamilnadu, India. ‘Memory Rain’ (2008) is her first book. An untutored painter and a lover of nature, ‘Nature at My Doorstep’ (2011), was an experimental blend of poems, prose and paintings. Third book ‘Vernal Strokes’ (2015) is a poetry collection. Her poems are found in journals like IJPCL, Quest, and in e magazines like Indian Rumination, Spark, Muse India, Enchanting Verses international, Spill words etc. She is anthologized in Roots and Wings (2011), Ripples of Peace (2018), Complexion Based Discrimination (2018) and Tranquil Muse (2018) and The Current (2019). 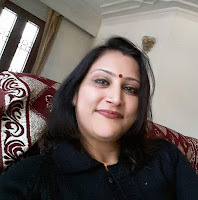 She is member of the poetic groups Poetry Chain, India poetry Circle and Aksharasthree - the Literary woman and World Peace and Harmony Association. Her poems reflect her reactions to what goes around her.